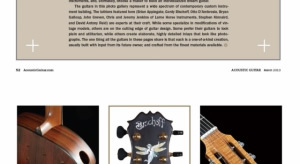 ACOUSTIC GUITAR MAGAZINE, US, PICK THEIR 8 DREAM GUITARS FROM AROUND THE WORLD, AND A DAVID ANTONY REID VAULTBACK IS ONE OF THEM. 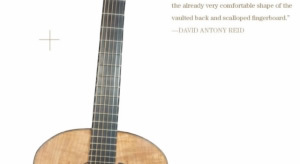 This heavily flamed sequoia top rubbishes the theory that it is the tube-like tracheid cells in spruce that channel sound. The very short grain here simply can’t have long tracheids, and it sounds fantastic! The bevel is one of the greatest modern innovations for guitar. I use these on all of my high-end instruments to complement the already very comfortable shape of the vaulted back and scalloped fingerboard.